Emerson Network Power and the Ponemon Institute worked together to determine the full economic cost of unplanned data center outages. Below is a preview, for the full report CLICK HERE. 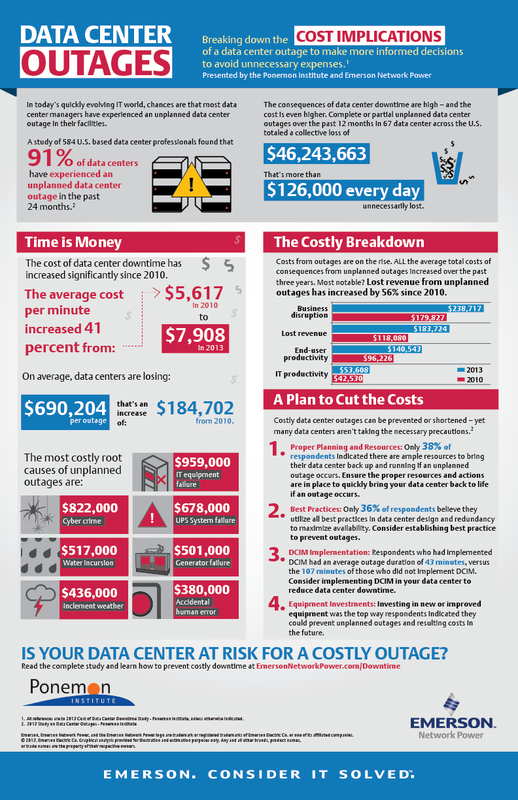 The 2013 Cost of Data Center Outages is the only benchmark study that attempts to estimate the full costs associated with an unplanned data center outage. According to the study, the cost of a data center outage has increased since 2010. The cost per square foot of data center outages now ranges from $45 to $95. Or, a minimum cost of $74,223 to a maximum of $1,734,433 per organization in our study. The overall average cost is $627,418 per incident.